I, Deanna am wearing the costume. The idea came when my mom bought me the light up bow. My mom recently passed away, with Minnie Mouse being her favorite character I thought it was the perfect costume. I made the "Minnie" dress by hand. I went to the Jo-Ann fabric store and purchased pink fabric as well as polka dot fabric. I designed and sewed my own polka dot Jumper Skirt, as well as the pink tub top. A family friend hand knitted the gloves for me. The bow was bought from a local vendor. 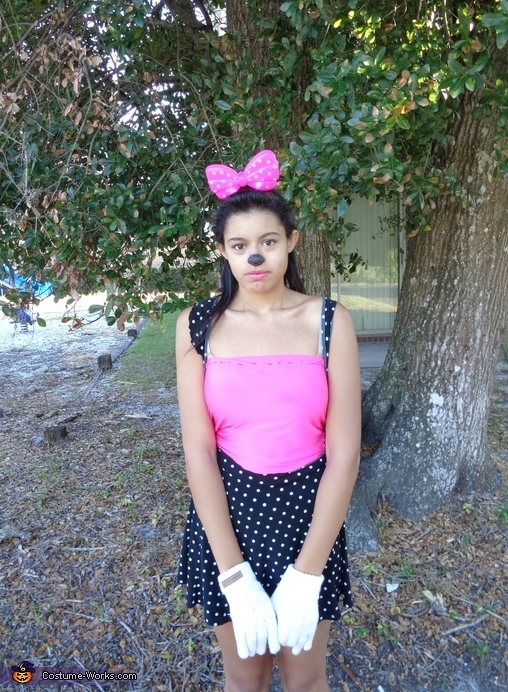 I put the classic black dot on my nose to signify Minnie Mouse.